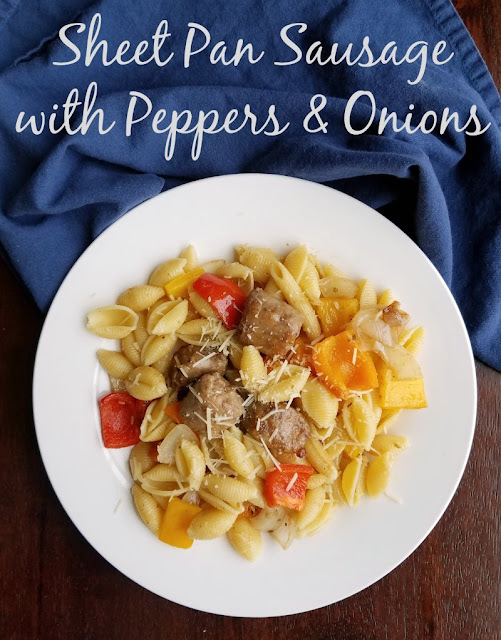 A tasty dinner that's full of flavor and short on dishes, this sheet pan sausage with peppers and onions is perfect tossed with pasta or served over rice. I have been waiting with baited breath for one of those two scenarios to play out with no luck. Maybe this is the year! In the meantime we have to plan our weeknight menus to be full of quick and easy meals. Pasta is a great way to quickly and affordably add bulk to a meal, so it shows up on our dinner table frequently. The fact that we are almost always happy to eat pasta doesn't hurt a thing. There are so many fun flavor profiles you can do too, so it's hard to get tired of it. When you go from creamy BBQ pulled pork spaghetti one night to one pot taco pasta the next, it hardly feels repetitive. 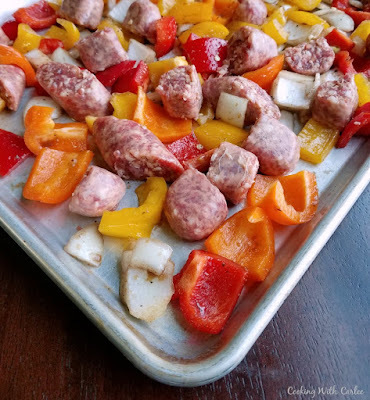 So go ahead and do this yummy sheet pan sausage and pepper dinner the next day without worrying about burn out! If you happen to be one if the mythical creatures that doesn't like pasta (but, why and how?!) you could always serve this over rice and it would be delicious as well. Or half the oil and pile it on a bun! As it is written though, it made a delicious and easy dinner with enough leftovers for me to have a couple of work lunches as well! The recipe is definitely simple enough. Just chop the veggies and let them marinate for a bit. Throw it all on a sheet pan and let it bake while the pasta cooks. The "marinade" then becomes the sauce for the pasta when you throw it all together. A sprinkle of Parmesan cheese is all that stands between you and dinner! Every time I make a sheet pan dinner I wonder why I don't make them more often. They have all been so flavorful and easy. Do you have favorite sheet pan suppers? I'd love to hear all about them! Preheat oven to 450 F and spray a rimmed sheet pan. In a large bowl, mix together oil, vinegar, garlic, oregano, basil, salt and pepper. Cut onion and peppers into large chunks, about 1" square. 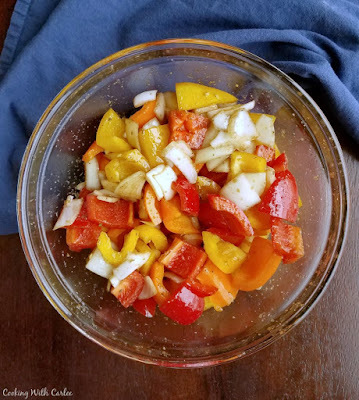 Toss onions and peppers in oil and vinegar mixture and let sit for 10 minutes if you have the time. Cut the sausages into bite sized pieces. Spread veggies and sausages over sheet pan and then drizzle with any remaining oil mixture. Bake for 20 to 25 minutes or until sausage is cooked through and vegetables are done to your liking. 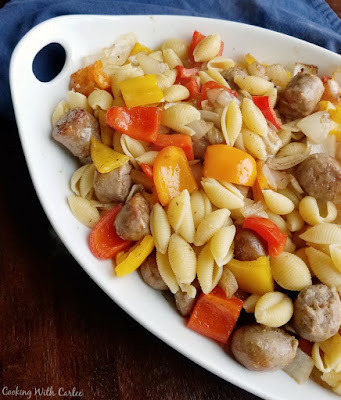 Toss pasta with veggies, sausage and pan drippings. Sprinkle with Parmesan cheese and serve. I've really been getting into sheet pan dinners lately, just love the flavor of the oven roasted veggies, Peppers and Sausage are a favorite combo. Your marinade is great! Girl, you are giving me all the great fresh new dinner ideas and my fam thanks you, lol!! Have a great day! Thank you so much! I love all of the twists and tweaks you can do to dinners like these to keep them fresh! 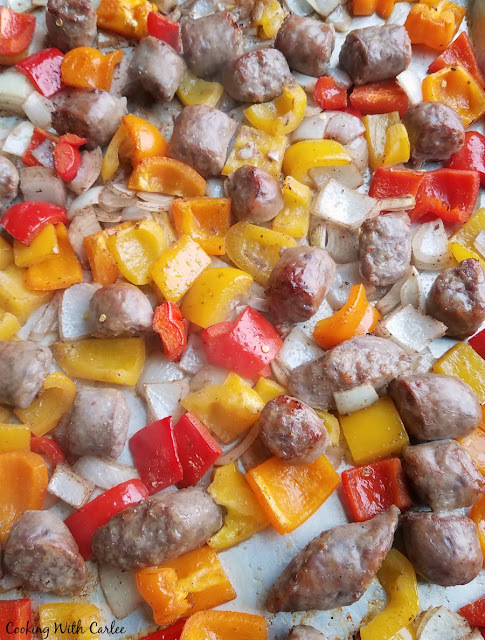 Your Sheet Pan Sausage with Peppers looks like comfort to me, yum! Hope you are having a great weekend and thanks so much for sharing your with us at Full Plate Thursday! I love them too! Thank you! It seems like I go through phases of cooking too. My blog has kind of forced me to change it up a bit, because I think "I can't put something that similar to what I just did, on the blog". I love sheet pan meals and this one looks like a real keeper. This is a great sheet pan dinner! Thanks so much for sharing your awesome post with us at Full Plate Thursday and hope to see you again real soon!